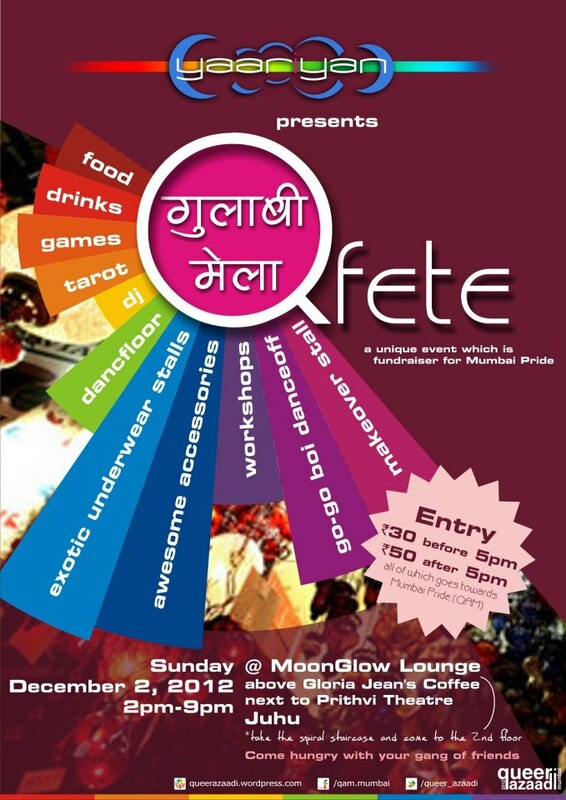 Yaariyan Presents Q-fete or Gulabi Mela, an Unique Event which will be a Fundraiser for Mumbai Pride! Yaariyan Presents Q-fete or Gulabi Mela, an Unique Event which will be a Fundraiser for Mumbai Pride! Come join us with you friends to experience food, drinks, games, tarot reading, Queer Books, awesome accessory stalls, exotic underwear, along with makeovers, workshops, DJ and a dance floor! Everything you can imagine and more! Rs. 50 after 5pm to enter the first and only all day party and fair yet and all of this goes to QAM so show up in huge numbers. 6pm – War of Go-go Boys! 6:30 pm onwards : Gossip’d DJ Nik will set the dancefloor on Fire! 1. You have to be 18 years old or above to attend this event. 2. Alcohol will only be served to those over 21years of age. 3. Smoking is not permitted on the premise. 4. Drugs and other illegal substances are strictly prohibited. 5. Outside Food and Drinks are not allowed. Previous post Gaysi Turns 4!! !